We offer a comfortable, well appointed, 'traditional' but modernly furnished accommodation in the gorgeous countryside of this region. The apartment has a queen double bedroom off of the living / dining / kitchen area. A bathroom with a larger, glass-walled shower makes the third room. There is a good size private terrace / garden to the rear, with lots of space to relax, with a garden table and chairs to take the indoors out. In the lounge there is a large TV with DVD player and a small DVD library. A wireless internet connection is available to keep your digital devices connected. Quite the rarity, yet sometimes a necessity here in Eus, touted "the sunniest village in France", there is full air conditioning in the living room and bedroom. You will appreciate it on the hottest days in July and August! Ceiling fans are also installed to keep you refreshed. A fully equipped kitchen with cooker, stove top and microwave will allow you to indulge a little 'French cuisine' if the mood should take. 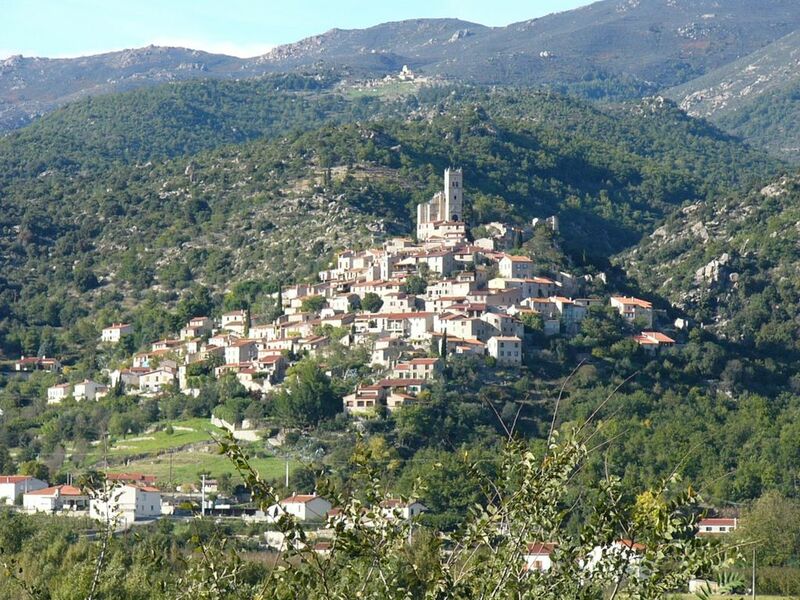 The small village of Eus is designated a 'plus beau ville de France' on account of it's stunning location and well kept 'old world' quaintness. The narrow alleyways are fringed with exotic plants and flowers and you can see that the locals take a great deal of pride in their lovely village. There are a number of artists and crafts people who live and work in Eus, and their products are available right from their workshops and galleries or in the craft-shop in the village square. If your appetite for local crafts is not satisfied here, there is a larger selection in the nearby, fortified village of Villefranche de Conflent. Eus is a popular destination in summer and is served by a busy bar in the square and a tapas bar/restaurant popular with the locals, with commanding sunset views at the top of the village. Dining experiences in Rousillon-Conflent are as varied as the countryside and its people and you will discover why the region is famed for it’s fusion of Catalan / French / Mediterranean cuisine. Close by is the market town of Prades, where supermarkets and other essential services are to be found and which hosts the annual Pablo Casals music festival in July/August. Market day on Tuesday and a local farmers market hosted in the town square on Saturday are must-do’s. There is lots for the visitor to enjoy in Eus and the surrounding area. For those on a cultural visit, there is history to be told in every village of the Conflent and beyond. The region is an important wine producer and if this interests you, there are several vineyards, which offer tours and tasting. Mountain sports from walking the hills and valleys to rafting and gorging the many rivers and tributaries are all on offer here in the foothills of the Pyrenees. The major ski resorts of Font-Romeu and Les Angles are less than an hour away by car or bus. Or take a scenic train ride to the mountains on the famous 'little yellow train' and then go for crepes in one of the many bars and restaurants of the fortress town of Mont-Louis. There is simply too much to do and to see in this stunningly beautiful and unspoiled area to give it justice here, better to go explore for yourself and you will see why the few who have discovered this tiny corner of France, always vow to return! The owners are Stacy and Stewart Monteith. We are probably best described as an 'international' couple, Stacy is from the States and Stewart is from the UK. We met and married in Kuwait where, amongst other far-flung places we have been teaching in schools for most of our careers. We now live in Florida, again teaching for a living but now more 'grounded' and intentionally, here to stay. Our Eus(ful) house was bought in 2005 to provide a 'home for the summer' when on school holidays and as a possible retirement home. Originally, it was one house that was converted into two flats by previous owners. We have kept it that way, but have completely redesigned and remodeled the interior and added windows, put on a new roof and new floors and floor beams in both apartments and of course had a complete rewire and plumbing. The outside areas and the 'cave' have also been given a complete overhaul from the rather 'utilitarian' condition they were found in. The renovation took 3 years but we have ended up with a property that has all the convenience and practicality of a modern home, but blends perfectly with the charming, old stone buildings of the village. We take great pride in our 'new' house and hope our guests will enjoy it as much as we do. Eus is possibly the most picturesque village in the conflent valley and almost irresistibly draws the eye as one drives along the road into the Pyrenees. When we were seeking a property to use a s a holiday / retirement home in the area, we never thought it would be possible to find an available home for sale. We consider ourselves extremely fortunate that there was indeed something available and what's more, a house which we fell in love with at first sight. We are now very happy that we can share the good fortune in being able to vacation in such a magical place with our guests who have always expressed a similar appreciation for their stay in our home from home in Eus. Large porcelain sink. Larger (90x90cm) porcelain shower, tiled, glass door and wall. Toilet. Extractor fan. Halogen lighting. In living area and bedroom. Available only on request for weekly rentals. Shared laundry room in basement. Small fee applies. 3 seater leather sofa. Two single seater easy chairs. TV in cabinet, with DVD. Views across the valley. Full size, freezer above. Built in with larder drawers and wine rack. Full set of pans, bowls, anything you may need. Sets of 6 at least. Fully equipped, high quality appliances. Oak preparation surface. Eat in, or out on large terrace table with sunbrella shade. The apartment occupies the top floor of a village house. It has it's own entrance to the rear of the building, directly onto 2nd floor. Fully equipped kitchen, all modern appliances. Opens onto private terrace with sun shade and garden table - Al fresco dining with views into the village and across the valley to the Canigou. Smoking restricted to outdoor areas. Traditional window shutters and double glazing throughout - warm in winter, cool in summer. Reversible AC / heater blower in living room and bedroom. Clothes washer and dryer available in annexed laundry room below property on special request, for a small fee. Street parking in front of property. Broadband wireless internet (for wifi enabled devices). The slightly larger cottage apartment to sleep up to 4 on the first floor is also available for rent, comprising double bedroom and an extra day-room with day bed. See property 419224 for details. A discount is available if both apartments are booked. Do not miss this place. , fantastic location and views, superb!! Smart apartment in picturesque village made us instantly feel welcome. Our first visit to this region of France. We found the property easily following excellent directions from owner. The apartment was very well equipped with everything needed to make it feel 'home from home'. The style of decor was tasteful and its fair to say that we spent a considerable part of our holiday at the apartment, eating some meals on the patio. The view of Pic De Canigou provides a stunning backdrop to this picturesque village. The maze of winding alleyways provide a multitude of different routes up to the church/restaurants and back. The village, whilst looking beautiful, has very few facilities. It took us a while to discover the nearest Boulangerie and supermarket (Prades). We're still not sure we understand the opening hours of shops! This would have been useful info to acquire in advance as we arrived on Sunday. The two restaurants (one bar/cafe style and one Tapas bar) were both well-positioned and a pleasure to visit. We found Eus to be a superb base from which to explore the area and visited Villefranche De Conflent, Abbaye St Martin, Castelnou, etc. We now wish to return with walking gear to explore the mountains a little more closely. It was perfect - equipped with everything, spotlessly clean and in a stunning location. Apartment on single floor at top of house with views from bedroom and living room overlooking Canigou across the valley. Really well fitted out with aircon if needed. Small patio at the back of the building with small rock garden, well shaded for dining outside or relaxing. Path immediately behind leads up to the top of the village for the church and 2 restaurants (that we found). Excellent tapas at el Lluert but need to book. Visited Perpignan, Villefranche-de-Conflent, Mont-Louis and Abbaye Saint-Martin du Canigou (40 min walk up the mountain but worth it). Well looked after by local agents. Glorious view from this superb village house. We had a wonderful 7 days in this lovely house overlooking Canigou. We got a warm welcome from Richard and the house had everything we needed. It was spotlessly clean and equipped with tasteful furnishings. We will return next autumn for more walking and eating! Everything we hoped for - a memorable vacation. We were very pleased with our stay in the beautiful village of Eus. The property was exactly as described. It was comfortable, clean and well supplied. The setting and the views were outstanding! The location is ideal for exploring the region. Highlights included Villefranche de Conflent, the Yellow Train, Mosset, Les Orgues near Ille-sur-Tet, the Abby of St. Martin, and all of the other small villages and towns we passed through. Another highlight was a visit to Collioure on the Mediterranean coast. A drive of just over an hour, but well worth it. The two weeks we spent there were high on our list of best vacations ever. A special thanks to Richard, the local property manager, who went out of his way to make our stay enjoyable. We highly recommend this property! The pretty village of Eus sits atop a small hill on the side of the Têt Valley, looking out across pink flowered peach orchards and commanding a magnificent view of the Canigou Mountain. In the valley below lies the market town of Prades, sleepy for most of the year but coming to life in August with the music of the Pablo Casals Festival. In the surrounding area, opportunities for an active vacation or a relaxing escape abound; from the castle-strewn history of the region (Villefranche/Castelnou) or the art-culture of Ceret and Figueres (Picasso/Dali), to the beaches and picturesque fishing villages of the Mediterranean coast (Argeles/Collioure) or the pursuit of adventure in the rugged Pyrenees mountains. Alternatively, indulge in therapeutic relaxation and resuscitation at the many sites of natural thermal springs (Molitg/Vernet les Bains). In the Winter months, take your skis up to the high slopes (Les Angles/Font Romeu), less than an hour away. Be inspired, it's all here! During the high (Summer) season, bookings only accepted Saturday through Saturday. Spring and Autumn, short bookings accepted either beginning or ending on a Saturday, no mid-week to mid-week. Check in after 4pm, check out before 10am on change-over weekends. Please request anything different ahead of vacation.